Family owned and operated since 1994, Bayshore Construction, Concrete, Waterproofing & Foundation Repair Specialist offers free estimates on basement waterproofing, foundation repair, patio installation and more for both residential and commercial customers. We are licensed, bonded, and insured. Bayshore Construction has an A+ rating with the Better Business Bureau. Call today for a free inspection and free estimate on your next project. Bayshore Construction has decades of experience with interior and exterior basement waterproofing. 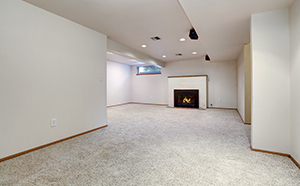 We offer a 12-year warranty with our full-service basement waterproofing system. Let us protect your home in southeast Michigan today! We offer mold evaluations, damp proofing, and more. Our custom concrete work can beautify your building. We pour patios, driveways, and curbs. 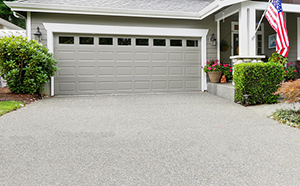 Washed aggregate driveways add a beautiful feature to your home. We also have a great deal of experience with commercial concrete projects including parking lots, garage and factory floors, and catch basins. Let us give you a free estimate today. Foundation repair requires expertise and we've been fixing foundations for many years. If you have bulges or cracks that you would like addressed, we can help. Bayshore Construction provides high quality foundation repair for both residential and commercial customers. We can provide a free estimate and diagnose your foundation problems. Many communities now require egress windows for homes that meet certain conditions. Having an escape route out of your basement in case of an emergency is an important safety feature for any home. Bayshore Construction installs many types of egress windows and will recommend an installation to meet your individual circumstances and your communities building code. Call us today for a free egress window estimate. 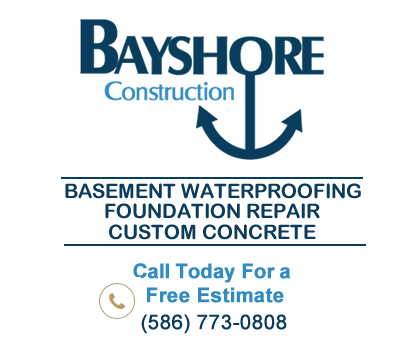 Call Bayshore Construction today for a free estimate on basement waterproofing, foundation repair, patio installation, driveways, and egress windows. "Bayshore waterproofed two walls in my home and repoured my patio and steps in washed aggregate. haven't had a drop of water and we're looking forward to using our new patio come spring"
We dig down, replace drain tiles, scrape walls, hand patch cracks, tar and plastic walls, remove dirt, backfill with pea gravel and clean up. We also offer interior basement waterproofing. 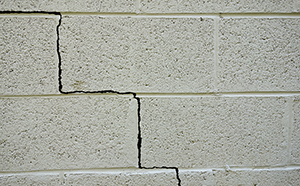 Bulging walls and cracks are an indication of foundation problems, A good foundation shouldn't move, so if yours has shifted over time it may need some help. We can get it to a normal place again without breaking your budget. With Bayshore, you get an experienced crew with years of driveway repair and installation experience. We are experts with washed aggregate driveways and will deliver long-lasting, reliable results. Call Bayshore Construction today for excellent results in basement waterproofing, foundation repair, driveway installation and repair, patio design and installation, and egress windows.